You need a reliable pump, but you also need the right tools to use it. Pioneer Pump is committed to providing information, tools, and resources to utilize our products to the fullest. Selecting the right pump for the job will save money, save time, and build trust and reliability. On this page, instructional videos and other training resources are freely available to help you succeed. 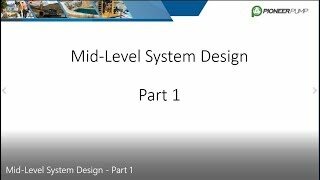 These short instructional videos give simple explanations of the core concepts we use when designing, selecting, and sizing the right pump. A brief history of the centrifugal pump and what styles are used by Pioneer. 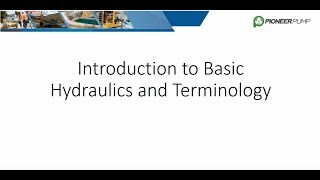 Get to know the language of the pump industry. 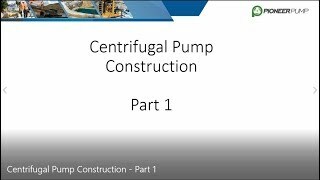 Explains the role of each component inside a centrifugal pump. Expands on different styles or options and their various uses. Further details regarding configurable pump options like flanges, priming systems, and materials of construction. Walks through the basic methodology of analyzing the piping system for the pump. Includes definitions and example calculations. Further detail on different pump arrangements, concepts, and calculations for sizing a pump. Pump curves are introduced.